SLENTRE.COM » 2008 SLentrepreneur of the Year Awarded to MIMI JUNEAU! 2008 SLentrepreneur of the Year Awarded to MIMI JUNEAU! Mimi Juneau named 2008 SLentrepreneur of the Year! The votes have been counted and the 2008 SLentrepreneur of the Year as chosen by SLENTRE.COM readers is Mimi Juneau. Also awarded were the 2 runners up – Saffia Widdershins in second place and Rusch Raymaker running a close third. 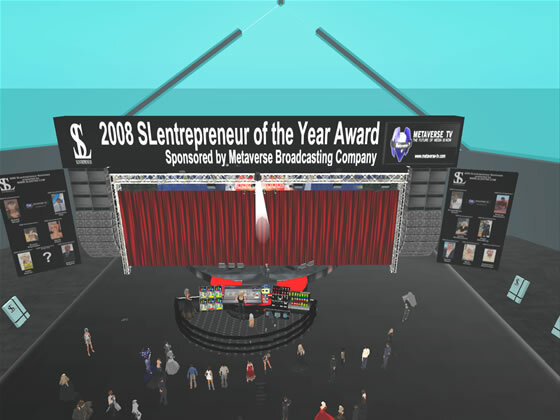 The top 3 nominees were honored at the first SLentrepreneur of the Year Award Ceremony in Second Life on Saturday. The race was extremely close and all 3 of the top entrepreneurs had supporters on hand to witness the announcement of the winner. “Oh my god, I’m so glad I don’t have to do this in voice. I’m in REAL tears now. I want to thank ALL my friends who voted for me. I read a bunch of such sweet comments on the website – it warmed my heart, guys !! I love you all ! I never thought a little reseller like myself made any difference, especially amongst all those very famous people – like Robustus, Rusch, Saffia, Dakota, Sachi, Vette and all the others I don’t know yet. I admire them very much ! A special thank you to all the creators I work with and who became my best friends – those like Bax Coen, traveller Bade, ziamela Loon, swaffette Firefly, Clio Cardiff, Thera Taurog, Anubis, bianca Foulon, Elettra Gausman, Unique moonsoo, Yelmer Pfeffer, Pidria Bonetto, Eponymous Trenchmouth and so many more! Thanks for your trust in me and a special thanks to my dear friends Dean Ashby and Emilia Redgrave for their support! Toneless Tomba sales his business, THiNC.